A knitted sweater by BOSS Menswear, cut for a regular fit. 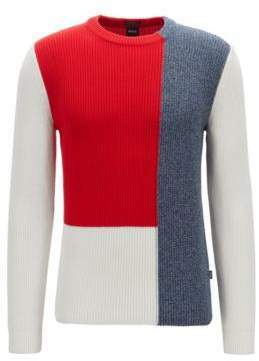 Crafted in pure cotton, this bold design features an all-over ribbed structure with colour-block panelling in a combination of solid and moulinÃ© yarns. Wear this crew-neck top with light-coloured trousers for easy summer style.